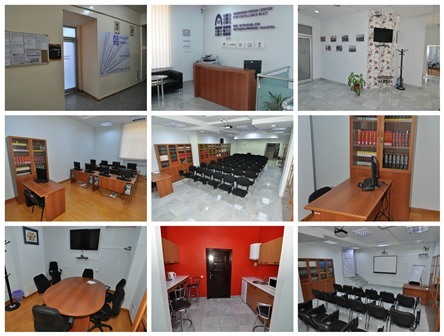 Armenian-Indian Center for Excellence in ICT (AITC) offers a shared working environment for everyone who is interested in the SYNERGY and wants to work in FLEXIBLE workspaces that include all needed equipment for an office space. Are you a freelancer, startup, entrepreneur, work-at-home professional or consultant, who works from home and can not afford own office at the moment? Who is perfectly suited for? We’d love to show you all privileges of a shared workspace community: you can meet new and interesting people, future partners and our friendly staff, launch and exchange ideas, use the meeting room, take a workshop and finally enjoy your working hours at AITC. We believe that by working together you can accomplish more than you could do alone, and we'd love you to join our friendly staff. The best way to find out is to visit us and discuss future collaboration. We are ready to set up a tour for YOU. Call us at +374 10/93 55 68 10 and make an appointment. NOTE: AITC’s available hours are from 10:00 to 21:00, from Monday to Friday. If you’ve been thinking about CoWorking, welcome to AITC.